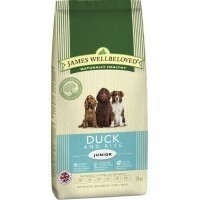 James Wellbeloved Junior Dog Duck and Rice contains all the wholesome, natural ingredients that a young growing dog requires to keep fit and healthy. This food is hypo-allergenic and particularly beneficial for those with nutritional intolerances. It helps to soothe skin irritations, has better digestibility and is low in histamines. In addition, this food is high in Omega 3 fatty acids to help maintain optimum health, has peas and chicory for fibre, uses natural sources of Vitamins C and E for antioxidants and contains olive oil for the high mono-unsaturated fat content. No artificial colours, flavours or preservatives have been added.